A Preview of Jesus’s Seminal Teachings and Leadership opens the pages of the four gospels, sharing their witness with devoted Bible students and inquisitive readers. 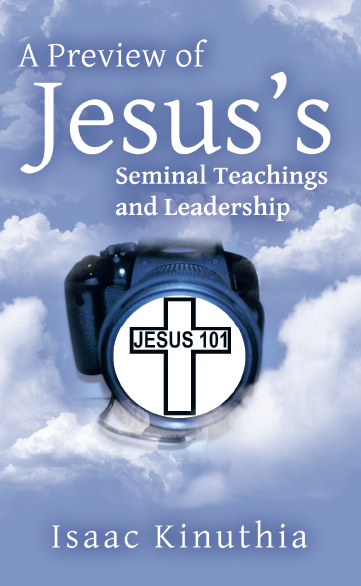 It highlights the essential messages of Jesus’ instructions for his followers and the central examples of his leadership for all who desire to obtain eternal life through his death and resurrection. Building upon years of personal study of the Scriptures and years of living as a Christian, Isaac Kinuthia brings to bear his background growing up in Kenya and studying and living in the United States as he shares a summary of Jesus’ words and deeds. Compactly written chapters address a variety of topics, including the lordship of Jesus, the promise of heaven, Jesus’ take on the Bible, the Ten Commandments, loving others, the sanctity of life, the power of prayer, the challenges presented by evil spirits, the reality of judgment, and Jesus second coming. Author comment: Jesus was and is an extraordinary leader followed by close to two billion people today, which is more than anyone on tweeter or Face book. Copyright © 2016. Isaac Kinuthia. All rights reserved.